After decades of seeing activists lay out the obvious economics of meat, and reading research by economists confirming the obvious, it looks as if the market finally is shifting. Eating meat is by far the number one impact to climate change and executives are starting to execute on the meatless menu, as you will see in a minute. It always has seemed weird to me that if you wanted to remove meat from your work meals, or airplanes for that matter, you had to check a special box. Really it should be the other way around. If someone wants to add meat, let them be the “special” case. Makes little to no sense to have meat automatically, and people should have to choose to accelerate global destruction, rather than set it as the mindless default. Let me be clear here. I’m not saying I would never check the box. I’m not saying there would never be need for meat. I would always want the default to be meatless. When I say make it rare I mean it both ways. The economics of why are obvious, as I will probably say continuously and forever. 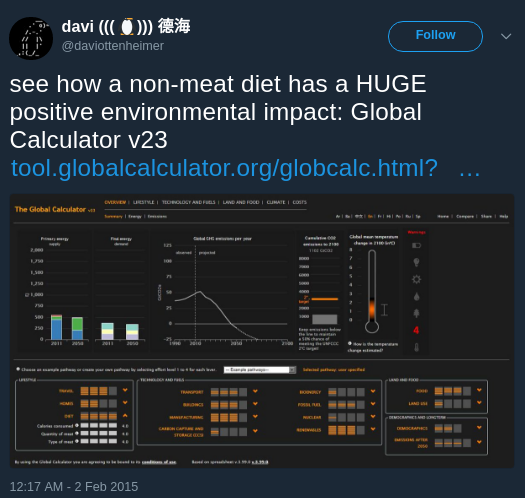 For example, years ago I was running the “Global Calculator” created for economic modeling, and reducing meat consumption undeniably had more impact than any other factors. The Global Calculator is a model of the world’s energy, land and food systems to 2050. It allows you to explore the world’s options for tackling climate change and see how they all add up. With the Calculator, you can find out whether everyone can have a good lifestyle while also tackling climate change. A sad and ironic side note here is the fact that meat consumption is the top factor in the “extinction crisis“, as 3/4 of earth’s animal population is disappearing at an alarming rate. I think it still may be counter-intuitive for a lot of folks when they hear they should stop eating meat to reduce climate change to prevent extinction of animals. If you really like meat you will eat it rarely. Get it? Thus a logical approach to solving many of the expensive problems people face today and into the future is to limit meat consumption within commercial space, because that’s where some expansive top-down decisions easily are made. Imagine Google removing meat from its school-lunch-like program for its school-campus-like facilities for its school-children-like staff running its school-peer-review-like search engine. Alas, that probably means real executive leadership (not exactly what you get with kids trying to stay in school forever) where someone issues a simple order to reflect a principled stand (pun intended). Instead it looks like Wework is the first apparently to be woke, as it has removed meat from its menus. …told its 6,000 global staff that they will no longer be able to expense meals including meat, and that it won’t pay for any red meat, poultry or pork at WeWork events. In an email to employees this week outlining the new policy, co-founder Miguel McKelvey said the firm’s upcoming internal “Summer Camp” retreat would offer no meat options for attendees. It’s crazy to me that someone is calling out new research here when there is so much legacy work, but I guess that covers the question why they waited so long to do the right thing. The winner: the assertion that there is no consensus among scientists, apparently supported by the Oregon Global Warming Petition Project. This website claims to hold a petition signed by “over 31,000 American scientists” stating there is no evidence that human CO2 release will cause climate change. The study also used the accurate statement that “97% of scientists agree on manmade climate change”. Prior work by van der Linden has shown this fact about scientific consensus is an effective ‘gateway’ for public acceptance of climate change. Bring out the facts! 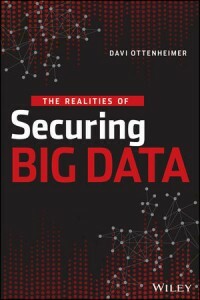 I’ve noticed security professionals often ignore climate change harm and need facts as a gateway to accept that there are risks. Maybe a good time to drop facts on these self-proclaimed risk management elites is when they head to Las Vegas this summer…observe them carelessly gorging on meat while claiming to care about threats to their environment, and hand them an invite them to an exclusive WeWork party.